Welcome to Tyrannosaurus-Rex.org our website about one of the largest and most awe-inspiring of the predatory dinosaurs. Tyrannosaurus rex was a giant carnivorous (meat-eating) dinosaur that lived at the end of the Cretaceous period, between about 67 and 65 million years ago. You can recognize Tyrannosaurus Rex by its huge head (filled with large teeth), powerful neck and tail, the fact it stands on its two rear legs, and its tiny forearms. An average adult Tyrannosaurus Rex was sized about 40 feet (12.3 meters) long, about 20 feet (6.1 meters) tall, and weighed around 7½ tons. Some adults however grew even larger, for example, one Tyrannosaurus nicknamed "Sue", (Sue is a fossil specimen kept in the Field Museum of Natural History in Chicago, Illinois) is about 42 feet (12.8 meters) long. 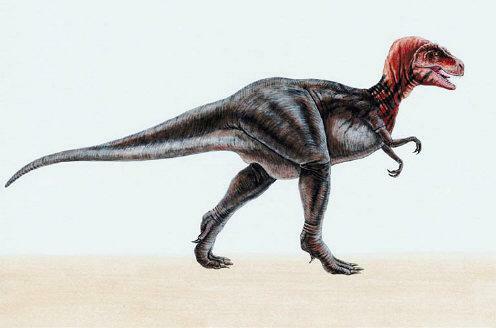 Tyrannosaurus was discovered by Barnum Brown in 1902 who found its fossils in Montana. Since then, additional who found its fossil specimens have been found in both North America and Asia. The name "Tyrannosaurus Rex" was chosen Henry Fairfield Osborn in 1905. The name, which like most scientific names of animals is based on Ancient Greek, means "tyrant king lizard". Today, there is a lot of debate about how Tyrannosaurus Rex lived. When the animal was first discovered, it was assumed to be a fearsome predator. However, some scientists have argued that Tyrannosaurus may not have been so fierce after all, and may mainly have been relatively slow-moving and a scavenger - feeding on the carcasses left by other predators. 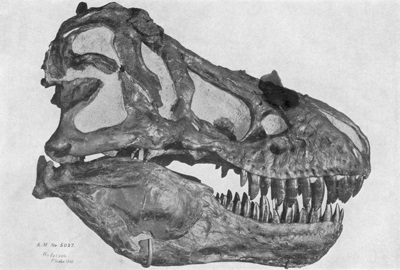 On the hand, other scientists still continue to argue that Tyrannosaurus Rex was a fearsome predator point to the largest areas of the brain associated with sight and smell (which would be useful for hunting), and its forwarding face eyes which would have provided binocular vision (helpful for judging distances and therefore also useful for hunting). How do scientists classify Tyrannosaurus Rex? Some key facts about Tyrannosaurus Rex. How did Tyrannosaurus Rex get its name? What does its name mean? How big was Tyrannosaurus Rex? Tyrannosaurus Rex history and timeline.